Coolant Chillers Manufactured by us is in great demand due to the latest developments in the machining technology which calls for the chilled coolant to avoid the deformation in the machined components. Highly sophisticated CNC machines & SPMâ��s demand high efficiency resulting in the temperature rise of the coolant oils beyond control. The Coolant Chillers we Supply in the market can be simply immersed in the coolant & cooling is achieved by means of direct contact. 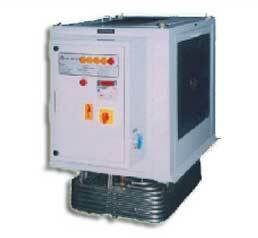 The Coolant Chillers is supplied with suitable filtration systems manufactured by us. Cooling Capacity Kcal/Hr 1285 to 30000 Kcal/Hr. Oil flow range (LPM) N.A. Port Inlet / outlet size, BSP (Female) N.A. Power supply. (50Hz Ac) 230V, 1ph / 415V, 3ph. © Copyright 2012. Warkin Equipments Pvt Ltd.